COMEDY IS HARD, but Micky Makes It Easy! Theater Review by Charles F. Rosenay!!! 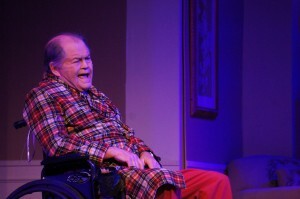 Once you get past the shock of seeing Micky Dolenz as a (gasp) 84-year old grandpa sitting in a wheelchair confined to an old-age home, you’re in for laugh-a-minute wild stage ride that is equal part comic shtick, near-perfect acting and classic theater. 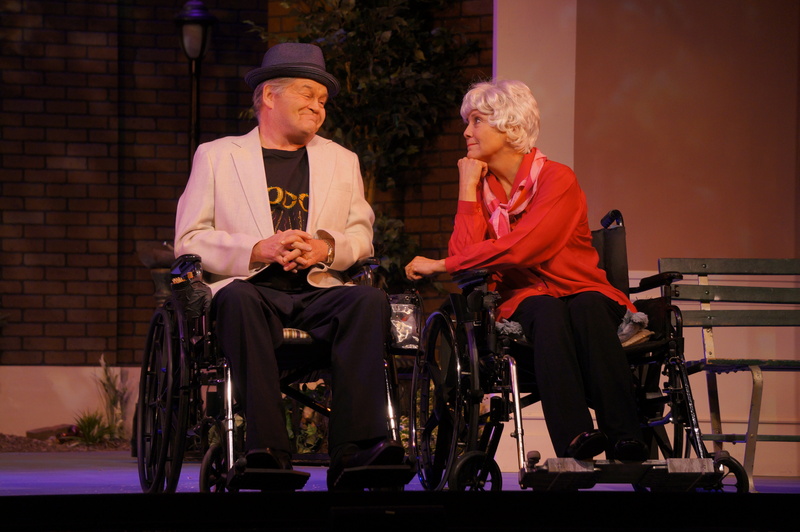 In the new play “Comedy Is Hard” gracing the intimate stage of Connecticut’s Ivoryton Playhouse, Micky Dolenz shares the stage with Joyce DeWitt, and it would be easy to categorize their roles as novelty or nostalgia casting. But instead it is actually brilliant casting, as the seasoned pros make you quickly forget you’re watching the two beloved, well-known actors, and instead are watching Lou and Kay, a pair of senior citizens in the twilight of their years. Micky plays Lou Goldberg, a veteran borscht-belt-era comedian who never transcended beyond the local Yuk Yuk clubs or the dreaded tours of Canada, and never connected with his straight-laced rather boring son, who’d rather keep him in the retirement facility than in his home; Joyce is spot-on at Kay, a buttoned-up former serious stage actress who would seem to be the polar opposite of Lou. An “odd couple” indeed, but their bond makes for countless laughs and just enough heartfelt moments. I’ve followed Micky for years and shouted the praises for this renaissance man fro as long as I can remember. Clearly he is one of the greatest and most-versatile voices of rock or pop music history, and I’ve had the pleasure of seeing Dolenz on stage in “Grease,” “Aida,” and “Pippin” (and wish I saw him in “Hairspray”) so one might think that the singer/actor/musician doesn’t really “take a giant step” in this stage role. Yet, in “Comedy Is Hard,” it’s incredible how much range he emotes as the (mostly) lovable slapstick octogenarian. Whether rolling out one joke after another, spouting some Yiddish, cursing or singing whimsical burlesque-esque ditties, you simply can’t take your eyes off him. Picture a cross between W.C. Fields, James Cagney, Larry Storch and the zany young Micky with the rubber face who dominated the comical scenes in The Monkees series, and you’ll get some idea of what Dolenz delivers in this production. And it’s mind-boggling the amount of lines that the leads needed to learn for the play – I saw the opening day matinee and couldn’t detect a flubbed joke or a missed line. The Simpsons’ Emmy and Peabody-award winning writer Mike Reiss, a Connecticut resident, has crafted an old-fashioned laugh-out-loud gem which could work just as well on a small New England stage as in a West End theater (of which Mr. Dolenz also has experience!). A few surprise and hilarious pokes at the town of Ivoryton and some other local references would need to be revised, but “Comedy Is Hard” should make it to an Off-Broadway stage in the future – hopefully with Dolenz and DeWitt – or even a Broadway stage if the likes of a Nathan Lane or (forgive me) Billy Crystal plus someone like Ann-Margret or Joan Collins took the leads. It could even be a cash cow for old-time Catskills comedians like Freddie Roman or Mal Z. Lawrence (who else is still alive?) if this ever toured. For now, take the last train to Essex or Old Saybrook, CT, as there’s no train station in Ivoryton, but be sure to find a way to get to the Ivoryton Playhouse and experience the pure joy, belly laughs and incredible acting of “Comedy Is Hard.” You’d be hard-pressed not to love it. 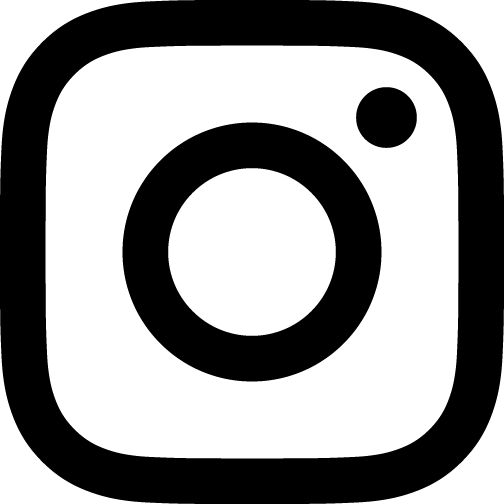 CONNECTICUT ARTS CONNECTION — An award-winning site for news and reviews of Connecticut’s professional theater and arts. Two long-time retired performers roll their wheelchairs up for a view at the Brooklyn Bridge and an unexpected curtain goes up on an exciting second act in their lives, starring friendship and possible romance. Welcome to Comedy is Hard from Connecticut native Mike Reiss, getting its world premiere at Ivoryton Playhouse. Reiss, a writer and producer for “The Simpsons,” “Ice Age: Dawn of the Dinosaurs,” Horton Hears a Who!” and other Hollywood scripts was last represented on stage in his home state with “I’m Connecticut,” which premiered at CT Repertory Theatre in 2012 (starring Joyce DeWitt). 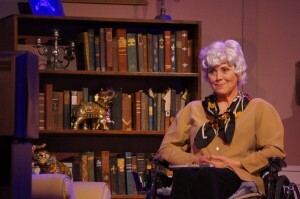 It subsequently had a run at Ivoryton, directed by Playhouse Artistic Director Jacqueline Hubbard, who helms Comedy is Hard. Dewitt, who is most known for her role on the TV sitcom “Three’s Company” has been tapped to star again in Reiss’s premiere, this time opposite Mickey Dolenz, whom you will remember from the popular music group The Monkees. Both give engaging performances, even if the play itself would be sharpened by a bit of trimming. 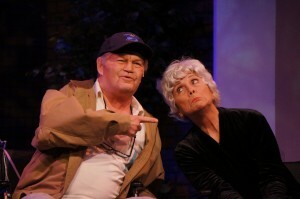 DeWitt is Kay, a former Broadway actress, who now lives in the actor’s home. Her nurse, Valentina (Dorian Mendez), doesn’t speak much English and infuriates her charge with responding to every request with, “Kay?” Does she mean OK, “why, in Spanish, or is she calling Kay by name? Frustrated Kay will never know. And doesn’t really want to. 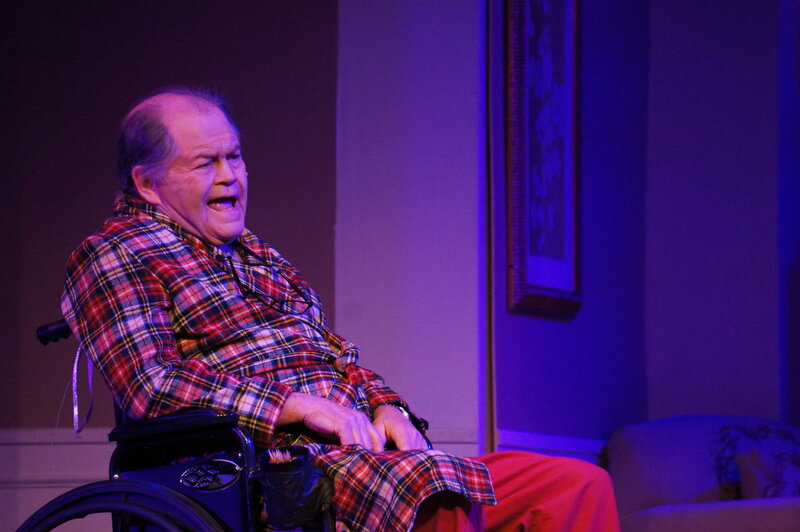 There are a couple of comedic characters thrown in with whom they interact: A Homeless Man (Michael Hotkowski) whom Kay encourages to return to acting and Mr. Holroyd (an amusing Dan Coyle), a seemingly unaware resident of the home who strikes furniture-like poses, but who has moments of lucidity and comments on the action taking place around him to the audience. Kay, more serious and annoyed by constant comparisons to rival Angela Lansbury, and Lou, always ready with a joke and his tag line, “Hey…. That’s comedy!,” are the embodiments of the comedy and drama masks, with Lou claiming that drama is easy, but comedy is hard. They prove to be good foils for each other and hatch a plan to put on a show for folks in the nursing home and community. The drama of choice? Becket’s Waiting for Godot, starring Mr. Holroyd as the tree…. There’s a problem however. Lou’s past insecurities, particularly a bad run in front of an audience that was not receptive to his comedy routine, leave him with a bad case of stage fright. Will he be able to perform and finally impress Phil, who still is resentful of growing up with an absentee father who was on the road playing comedy clubs? If you’re a good entertainer, Lou confides in Kay, you’re a bad parent because you have put everything you have into performing to earn a living for you family. The problem is you don’t have anything left to give when you return home. “Somebody changed the rules about what it is to be a good father,” Kay comforts. Moments of poignancy like this help balance a script that seems always to be trying just a bit too hard to find its next laugh. DeWitt and Dolenz have sizzling on-stage chemistry. A fake texting bit between the two old timers is a hoot and had the audience in stitches. There are a lot of belly laughs too – and this Waiting for Godot should win an award for giving what normally is one of the most boring plays known to man an entertaining and hilarious staging. Coyle also is equally entertaining while striking a pose or waxing eloquent, but we are confused about whether Mr. Holroyd’s commentary is audible to the other characters or whether it is just what he’s thinking. The script tends to wander a bit too long, even at just over two hours with an intermission. A 90-minute, trimmed version giving us a bit deeper glimpse behind the comedy and drama masks the characters wear would improve the story. First trim suggestion: Cut the distracting and unnecessary projections (Gaylen Ferstand, design). Comedy is Hard runs through Oct. 12 at Ivoryton Playhouse, 103 Main St., Ivoryton. Performances are Wednesday and Sunday matinees at 2 pm. Evening performances are Wednesday and Thursday at 7:30, Friday and Saturday at 8. Tickets: $42 for adults, $37 for seniors, $20 for students and $15 for children. (860) 767-7318; www.ivorytonplayhouse.org. Theater has long been a see-saw balance of tragedy and comedy, with an occasional dip into dramedy, where the elements involved both vie for top billing. In Mike Reiss’ world premiere production “Comedy Is Hard!” two long time veteran performers struggle to find an answer that satisfies them both. Set in their twilight years, both Kay and Lou have graced the stage for decades, Kay as a dedicated actress of drama and Lou doing it all for laughs. He is 84 years young and is trapped in a wheelchair due to a stroke. She is 60+12 and also finds herself in a wheelchair due to a slip in the shower. Fortunately for the audience, Kay is the delightful Joyce DeWitt from “Three’s Company” and Lou is the favorite Monkees’ star Mickey Dolenz. Ivoryton Playhouse will be free wheeling this theatrical debate until Sunday, October 12 for your entertainment pleasure. When the two meet in a park in Manhattan, Kay is with her almost non-verbal nurse Valentina (Dorian Mendez) and Lou is being ferried around by his uncooperative son Phil (Michael McDermott). They share their history on the stage and argue over whose career is more meaningful and deserving of praise. Along the way, they find themselves in The Actors Home in New Jersey and encounter diverse objects, situations and personages from Tinkerbell to Elmo to Angela Lansbury, disco balls, bicycle bells to balloons, pancakes to tuna fish sandwiches, to Canadians who have yet to learn to laugh to mysterious ladies sporting red berets. When the pair decide to put on a play, Beckett’s “Waiting for Godot,” the age old question of which is harder and has more value, comedy or tragedy, has a chance of being answered. This end of life story is sweetness with a tinge of sadness. Jacqueline Hubbard directs it with a poignancy that lends its authenticity. Also in the cast are a homeless man (Michael Hotkowski) and a retired actor (Dan Coyle) who add color to the tale. 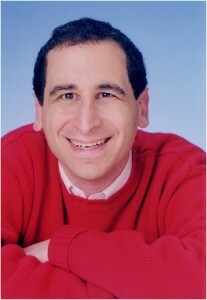 Mike Reiss’ sense of humor is evident throughout as his one liners create chuckles, giggles and guffaws. For tickets ($42, seniors $37, students $20 and children $15), call the Ivoryton Playhouse, 103 Main Street, Ivoryton at 860-767-7318 or online at www.ivorytonplayhouse.org. Performances are Wednesday at 2 p.m. and 7:30 p.m., Thursday at 7:30 p.m., Friday at 8 p.m., Saturday at 8 p.m. and Sunday at 2 p.m. Put your mask of comedy firmly in place as Joyce DeWitt and Mickey Dolenz invite you into their world of entertainment, courtesy of funny man Mike Reiss. Very funny and very entertaining, we are thrilled that Mike can be with us to talk about writing Comedy is Hard, answer questions and meet audience members. Join us on these dates! Event is free with your purchase of theatre tickets on these nights. “Comedy is Hard!” Video Clip – Check It Out! Our thanks to Outthink for producing this great video clip for Comedy is Hard. Micky, Joyce and Jacqui, oh my!!! World Premiere “Comedy is Hard!” Now Open! New York/Ivoryton – The world premiere of a brand new play by acclaimed writer of The Simpsons, Mike Reiss, will take place at the historic Ivoryton Playhouse in Ivoryton, CT. Previews begin September 24th – the play opens on September 26th and runs through October 12th. MICKY DOLENZ (of The Monkees) will star alongside JOYCE DEWITT, veteran actress and star of the ABC television hit series Three’s Company. Dolenz has delighted audiences with his performances on stage in the Elton John/Tim Rice production of Aida; Grease; Pippin’; A Funny Thing Happened On The Way To The Forum; and, most recently Hairspray in the West End playing Wilbur Turnblad. COMEDY IS HARD is a story of friendship and friction between an aging comedian and a veteran dramatic actress in a home for retired performers. It’s about life, love, show business, and the importance of growing old disgracefully. Reiss, who is writer and producer for the long running TV show, The Simpsons, also created the animated series The Critic; the webtoon Queer Duck and worked on the screenplays for Ice Age: Dawn of the Dinosaurs; Horton Hears a Who! ; The Simpsons: The Movies; and, My Life In Ruins. Ivoryton audiences turned out in droves in the June 2013 for his hilarious play, I’m Connecticut, which was a huge popular and critical success. Comedy is Hard! opens at the Ivoryton Playhouse on September 24 and runs through October 12, 2014. Directed by Playhouse Artistic Director, Jacqueline Hubbard, the cast includes Michael McDermott*, Dan Coyle, Dorian Mendez and Michael Hotkowski. The set design is by Dan Nischan, lighting by Marcus Abbott and costumes by Lenore Grunko. Executive Producer is Michael A. Dattilo. Performance times are Wednesday and Sunday matinees at 2pm. Evening performances are Wednesday and Thursday at 7:30pm, Friday and Saturday at 8pm. There will be talkbacks with the writer – check our website for details. Tickets are $42 for adults, $37 for seniors, $20 for students and $15 for children and are available by calling the Playhouse box office at 860-767-7318 or by visiting our website at www.ivorytonplayhouse.org (Group rates are available by calling the box office for information.) The Playhouse is located at 103 Main Street in Ivoryton. Micky Dolenz, Joyce DeWitt and Mike Reiss answer the question: who is the funniest person they’ve ever met?